THE LONG AND FARAWAY GONE is the story of two people and their pasts. Wyatt Rivers was still in high school when the Oklahoma City movie theatre at which he was working was robbed at gunpoint one night in August 1986. All the other staff were shot and killed but Wyatt didn’t have a single physical injury when police found him lying amidst the bodies. In 2012 Wyatt is a private investigator in Las Vegas and has spent his entire life trying to forget. Trying not to ponder the unanswerable question: why is he still here and all the others gone? Julianna Rosales was 12 when, about a month after the movie cinema incident, her 17 year old sister left her alone at the State Fair with $10 to spend and the promise that she would be back in just 15 minutes. Before it got dark dark. Genevieve, a ‘bad girl’ by most people’s definitions and beautiful to boot, disappeared that night. Initially thought to have run away but at some point presumed dead, though her body has never been found. Still living in Oklahoma City Julianna is now a nurse with as much of a normal life as she can fit in around her obsession. How could Genevieve leave her alone? This is a book for lovers of great characters. Wyatt and Julianna are, at least on the surface, very different people but both totally captivated me. I sometimes find that when a book’s perspective is shared I am more interested in one person’s story and can be resentful when I am pulled out of my favourite character’s thread but here I was equally engrossed in both characters. Wyatt is funny and self-deprecating and has really tried to move beyond the event that marked his life by changing his name and moving around a lot. Julianna on the other hand is more intense with a darker strain of humour and cannot seem to let go of the search for her sister, even briefly. They are used to depict two different ways of dealing with (or not) traumatic events though we see by the end that they are more similar than they appear. I’m not ashamed to admit that I am a little bit in love with both of them. There are some terrific minor characters too, with my favourite being Candace: a cocktail waitress who inherits a run down live music venue from an ‘old guy’ (he’s 50) who everyone assumes she slept with. Her interactions with Wyatt – who is hired by one of her relatives to investigate the weird harassment she has been enduring – are a highlight of the novel. This also a book for lovers of great stories. I gave up thinking I knew where the narrative was going after the first couple of chapters and I’d gotten about three major plot points completely wrong. There is genuine surprise and suspense here but it never feels like the reader is being manipulated. There’s no obvious withholding of information or obfuscation of facts and both mysteries unfold entirely naturally. The resolutions to the mysteries of each main character are both very satisfying even though neither is dramatic or the sort of thing traditional crime fiction readers might expect. The musical and the bombing is about all I knew of Oklahoma before reading this book but I feel like I could at least recognise Oklahoma City if I were to visit now. Partly this is down to Berney’s excellent depiction of the place both past and present, and partly because I see a familiarity in a city of similar size and background to my own. Places built on the backs of energy companies, where sports reign supreme in the local consciousness and about which no one who doesn’t live there gives a second thought unless there is a crime so horrendous that they’re forced to pay attention for a moment. It is particularly interesting to see the city through Wyatt’s eyes as he left soon after the shooting her survived and hasn’t been back since. The changes that time and the revitalisation efforts which followed the Murrah building bombing are starkly obvious to him. 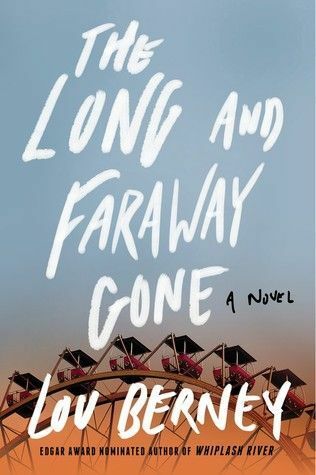 THE LONG AND FARAWAY GONE is a book about the slipperiness of memory and surviving tragedy however you can. Its characters are flawed but not fatally and their struggles are captivating at least in part because they are accompanied by a healthy dose of humour. Finding books like this is what I dared to hope for when I embarked upon my virtual tour of the USA through its fiction. Lou Berney is a keeper. This is the eleventh book I’m including in my quest to complete the Reading USA Fiction Challenge in which I’m aiming to read a total of 51 books, one set in each of the USA (and one for the District of Columbia). My personal twist is that all the books are by new (to me) authors. This entry was posted in book review, Lou Berney, USA. Bookmark the permalink. i have meant to read this one since it came out. Maybe this will push me on. I keep hearing great things about this one, Bernadette. And one of the things I’m told is how good the sense of setting and context really is. I may have to look this one up. I am glad you found a good book for Oklahoma. I don’t know that I have ever read a book set in Oklahoma, so maybe I will use this one too… eventually. I’m glad you liked this book so much. Your review is excellent and delves deeply into the plot and the characters. Now I feel like I have to reread it. I’m glad I recommended it to you. Hope more people read it.